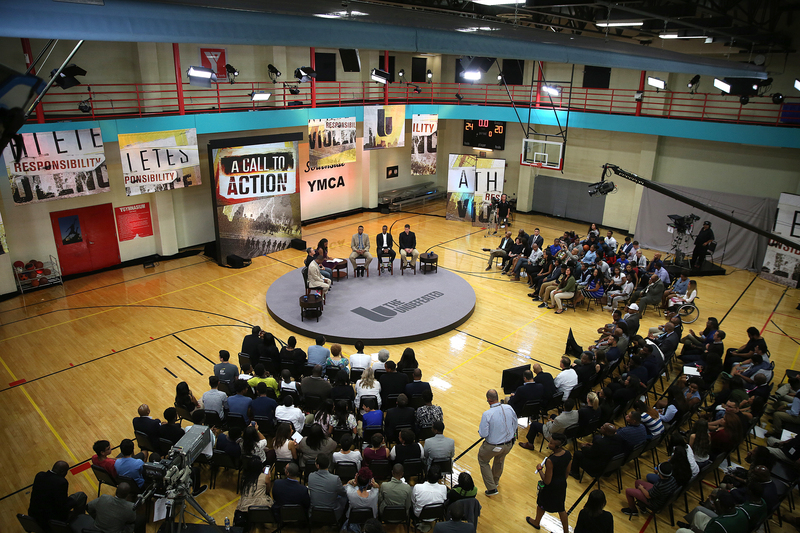 The final panel during "An Undefeated Conversation: Athletes, Responsibility, and Violence" on August 25, 2016 at the South Side YMCA in Chicago, Illinois. 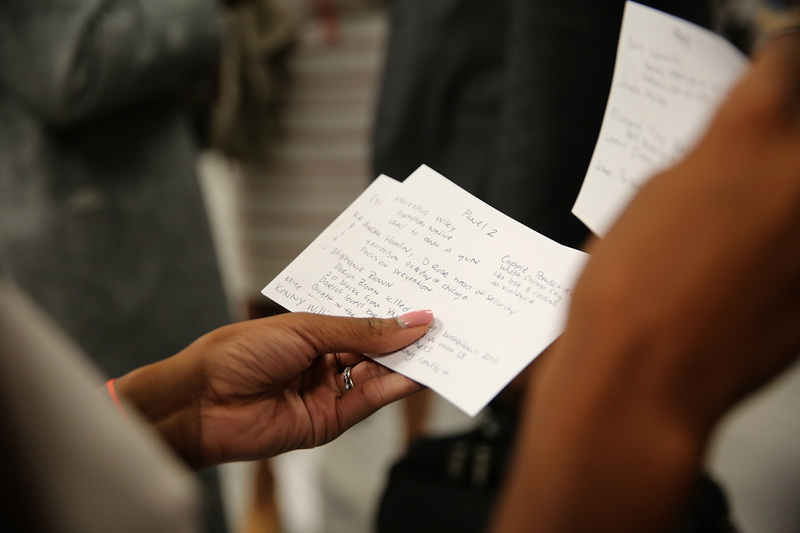 Four panels made up of community members, athletes and journalist talked about the issues of gun violence, solutions and the roles that athletes have to help the solve the issues. 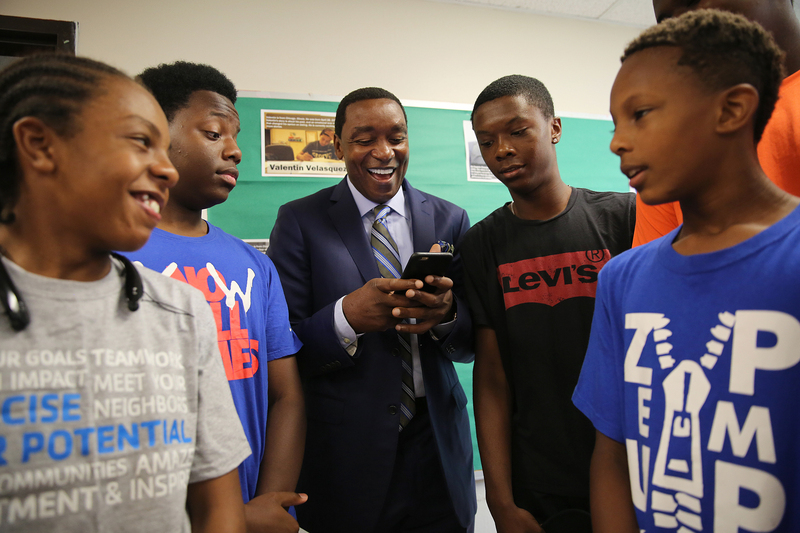 NBA Hall of Famer Isiah Thomas tries to set his camera up to take a group photo with children before the start of "An Undefeated Conversation: Athletes, Responsibility, and Violence" on August 25, 2016 at the South Side YMCA in Chicago, Illinois. Four panels made up of community members, athletes and journalist talked about the issues of gun violence, solutions and the roles that athletes have to help the solve the issues. 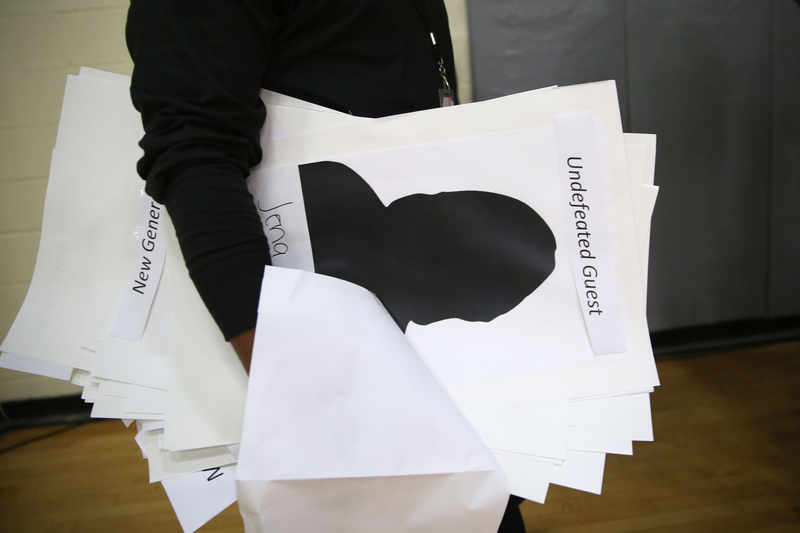 Posters used for seating are removed before the start of "An Undefeated Conversation: Athletes, Responsibility, and Violence" on August 25, 2016 at the South Side YMCA in Chicago, Illinois. Four panels made up of community members, athletes and journalist talked about the issues of gun violence, solutions and the roles that athletes have to help the solve the issues. 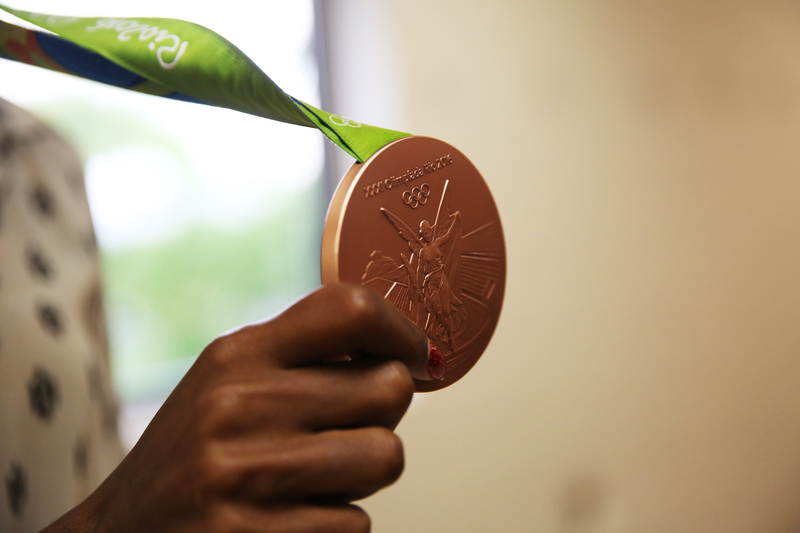 Kristi Castlin holds out her bronze medal from the 2016 Olympics before the start of "An Undefeated Conversation: Athletes, Responsibility, and Violence" on August 25, 2016 at the South Side YMCA in Chicago, Illinois. 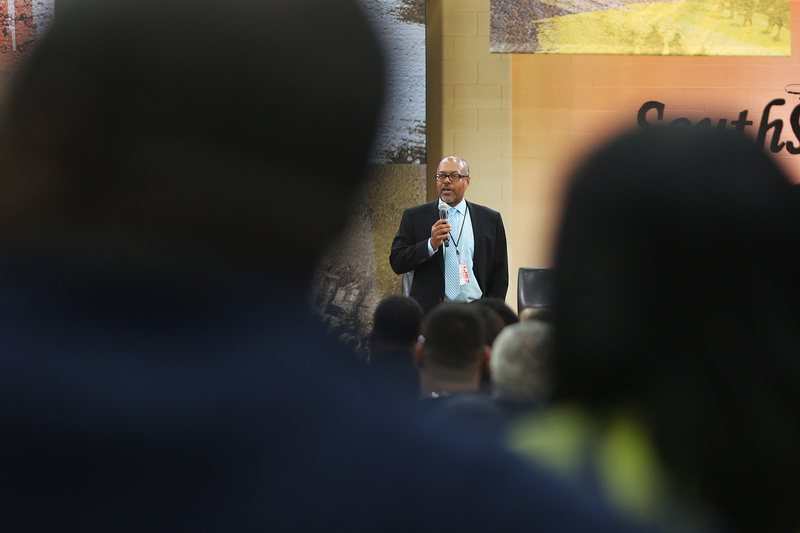 Four panels made up of community members, athletes and journalist talked about the issues of gun violence, solutions and the roles that athletes have to help the solve the issues. 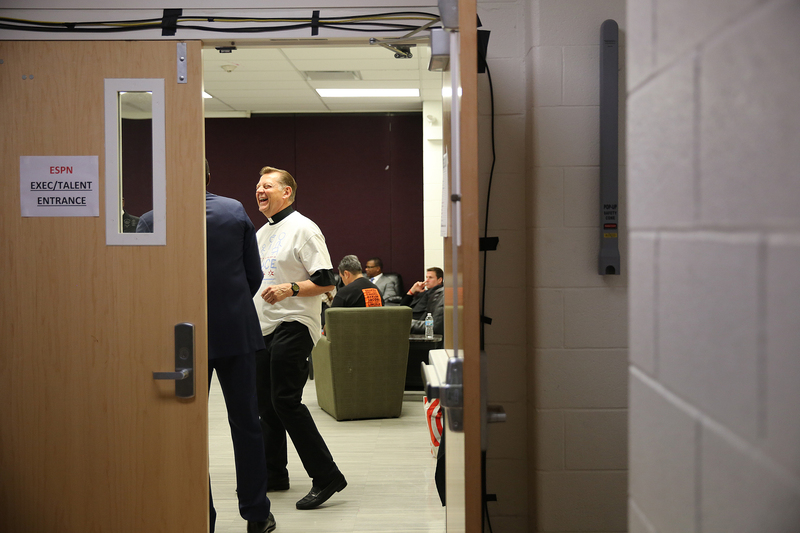 Father Michael Pfleger talks with people backstage before the start of "An Undefeated Conversation: Athletes, Responsibility, and Violence" on August 25, 2016 at the South Side YMCA in Chicago, Illinois. 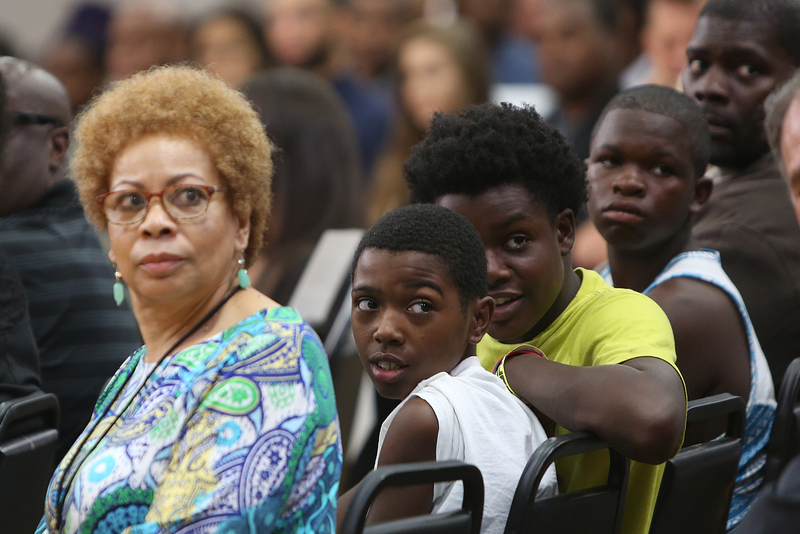 Four panels made up of community members, athletes and journalist talked about the issues of gun violence, solutions and the roles that athletes have to help the solve the issues. 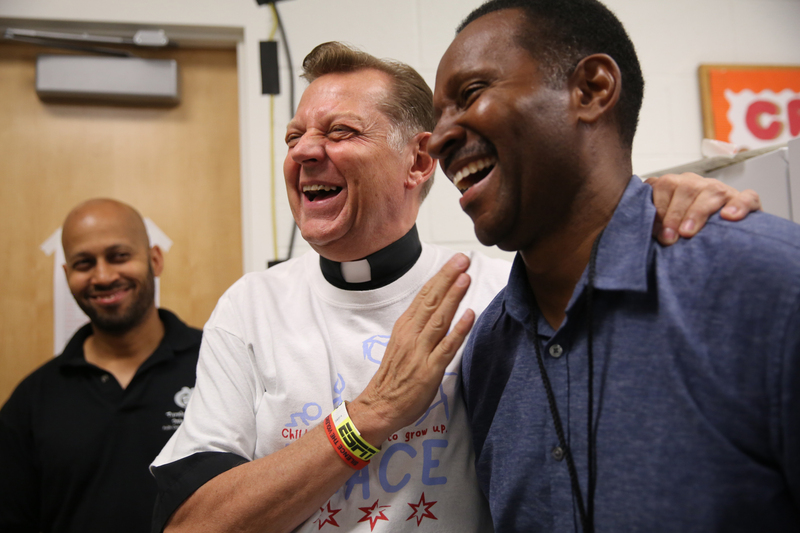 Father Michael Pfleger laughs back state with Rajon Rondo before the start of "An Undefeated Conversation: Athletes, Responsibility, and Violence" on August 25, 2016 at the South Side YMCA in Chicago, Illinois. 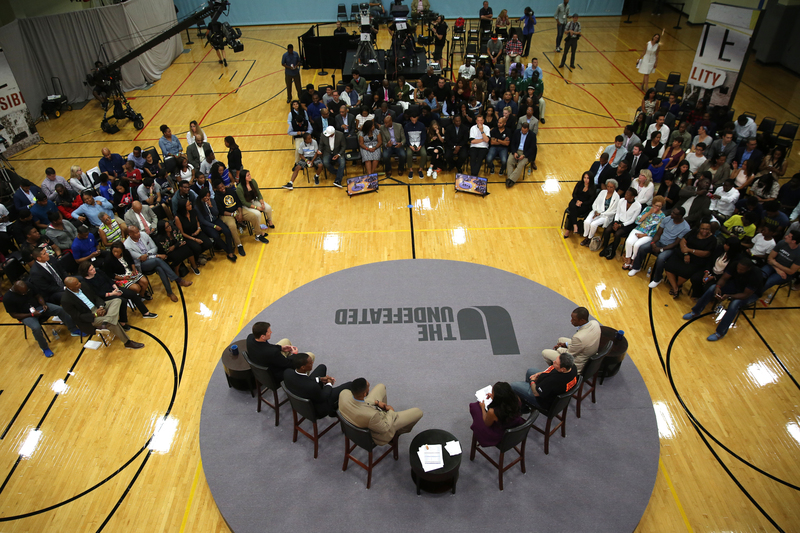 Four panels made up of community members, athletes and journalist talked about the issues of gun violence, solutions and the roles that athletes have to help the solve the issues. 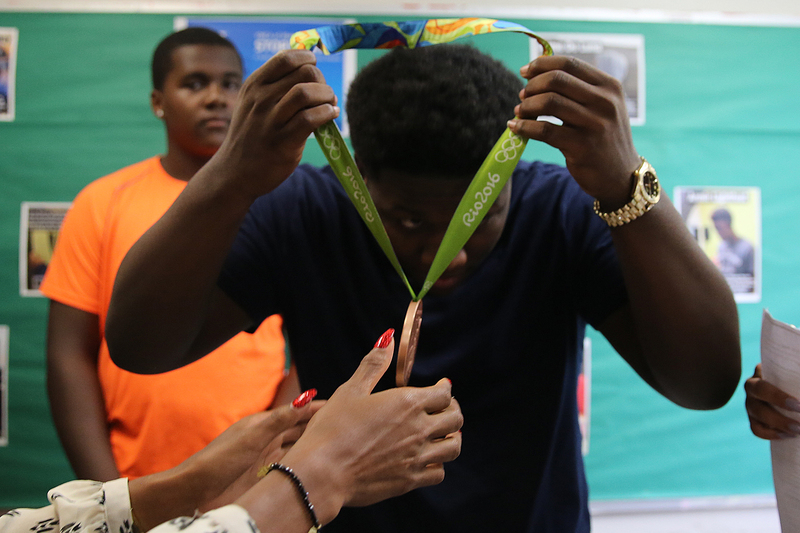 Last minute checks take place before the start of "An Undefeated Conversation: Athletes, Responsibility, and Violence" on August 25, 2016 at the South Side YMCA in Chicago, Illinois. Four panels made up of community members, athletes and journalist talked about the issues of gun violence, solutions and the roles that athletes have to help the solve the issues. Chicago Bulls guard Rajon Rondo makes his way to the seating area for the start of "An Undefeated Conversation: Athletes, Responsibility, and Violence" on August 25, 2016 at the South Side YMCA in Chicago, Illinois. Four panels made up of community members, athletes and journalist talked about the issues of gun violence, solutions and the roles that athletes have to help the solve the issues. 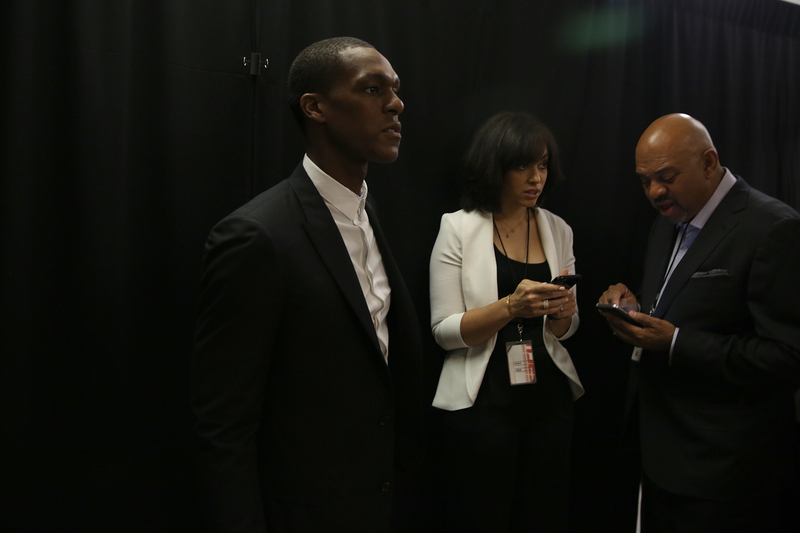 Chicago Bulls guard Rajon Rondo waits before going in for the start of "An Undefeated Conversation: Athletes, Responsibility, and Violence" on August 25, 2016 at the South Side YMCA in Chicago, Illinois. Four panels made up of community members, athletes and journalist talked about the issues of gun violence, solutions and the roles that athletes have to help the solve the issues. 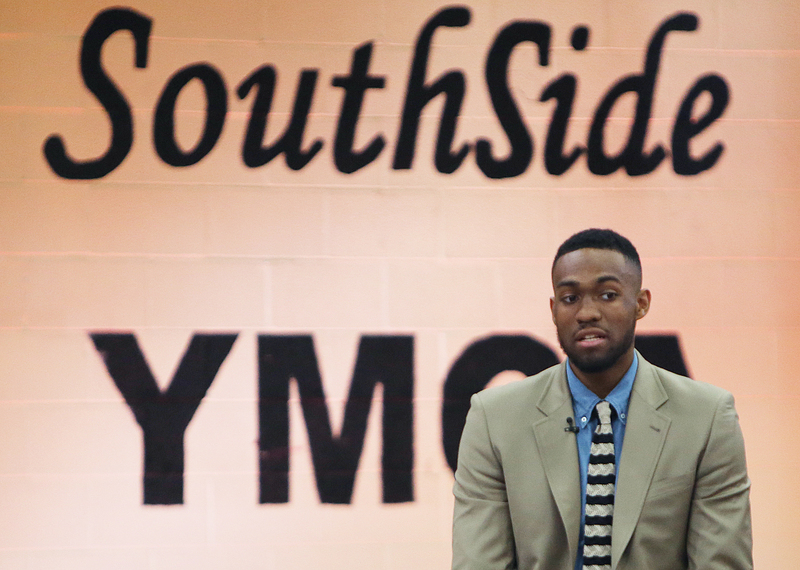 Chicago native and Milwaukee Bucks forward Jabari Parker talks about his experience of growing up in Chicago during "An Undefeated Conversation: Athletes, Responsibility, and Violence" on August 25, 2016 at the South Side YMCA in Chicago, Illinois. Four panels made up of community members, athletes and journalist talked about the issues of gun violence, solutions and the roles that athletes have to help the solve the issues. 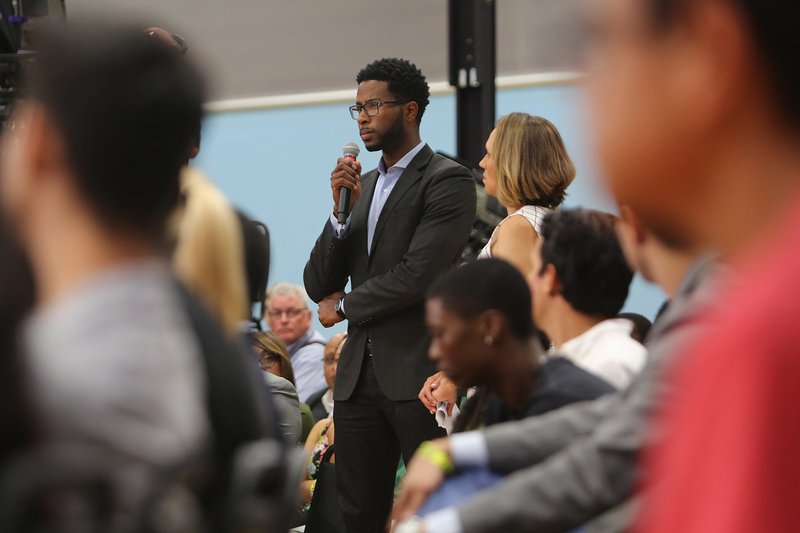 Editor-In-Chief for The Undefeated Kevin Merida speaks to the audience before the start of "An Undefeated Conversation: Athletes, Responsibility, and Violence" on August 25, 2016 at the South Side YMCA in Chicago, Illinois. Four panels made up of community members, athletes and journalist talked about the issues of gun violence, solutions and the roles that athletes have to help the solve the issues. 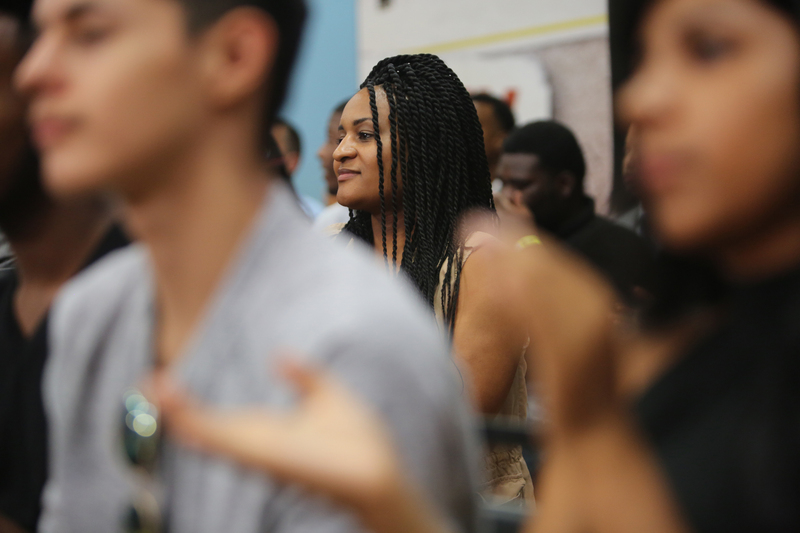 The audience watches as Rondo Rajon of the Chicago Bulls walks in during "An Undefeated Conversation: Athletes, Responsibility, and Violence" on August 25, 2016 at the South Side YMCA in Chicago, Illinois. Four panels made up of community members, athletes and journalist talked about the issues of gun violence, solutions and the roles that athletes have to help the solve the issues. 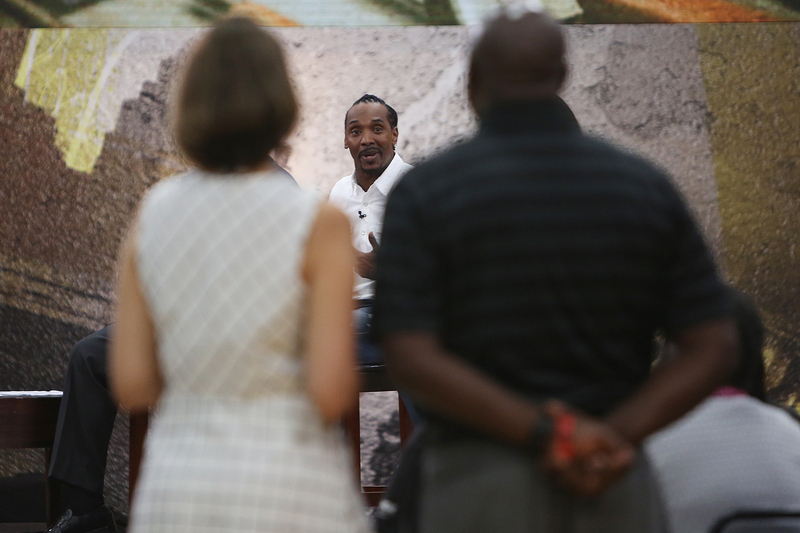 An audience member asks a question to the first pane of the day during "An Undefeated Conversation: Athletes, Responsibility, and Violence" on August 25, 2016 at the South Side YMCA in Chicago, Illinois. Four panels made up of community members, athletes and journalist talked about the issues of gun violence, solutions and the roles that athletes have to help the solve the issues. 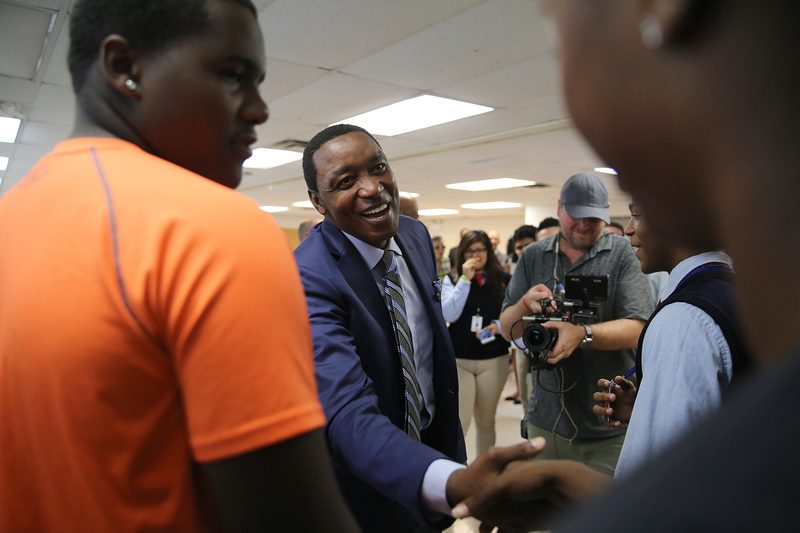 Andre Hamlin jokes about his time guarding New York Knicks player Derrick Rose during "An Undefeated Conversation: Athletes, Responsibility, and Violence" on August 25, 2016 at the South Side YMCA in Chicago, Illinois. Four panels made up of community members, athletes and journalist talked about the issues of gun violence, solutions and the roles that athletes have to help the solve the issues. 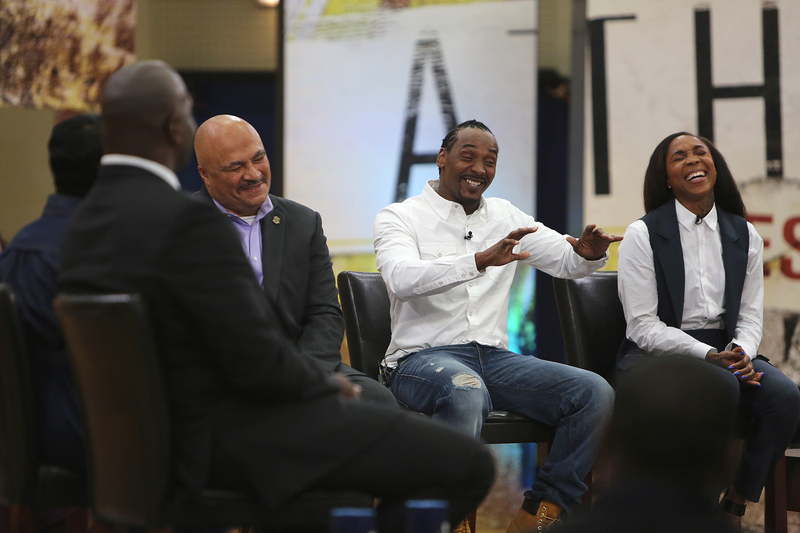 Marcellus Wiley talks about what event took place that made him have to walk around with a gun while still playing in the NFL during "An Undefeated Conversation: Athletes, Responsibility, and Violence" on August 25, 2016 at the South Side YMCA in Chicago, Illinois. Four panels made up of community members, athletes and journalist talked about the issues of gun violence, solutions and the roles that athletes have to help the solve the issues. 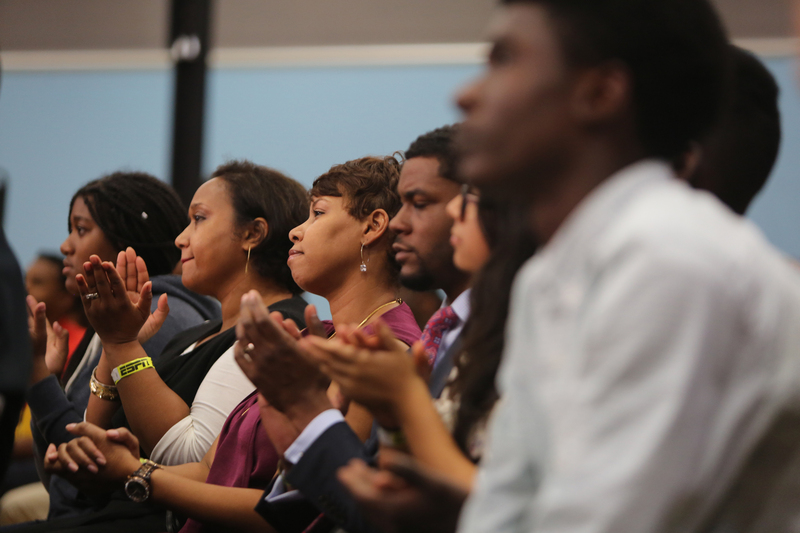 Audience members applaud during "An Undefeated Conversation: Athletes, Responsibility, and Violence" on August 25, 2016 at the South Side YMCA in Chicago, Illinois. Four panels made up of community members, athletes and journalist talked about the issues of gun violence, solutions and the roles that athletes have to help the solve the issues. 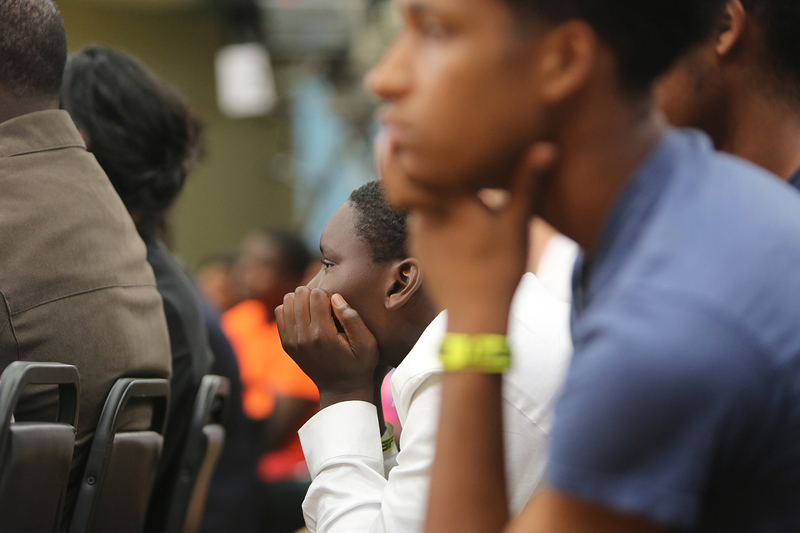 Audience members watch the panel about guns and violence during "An Undefeated Conversation: Athletes, Responsibility, and Violence" on August 25, 2016 at the South Side YMCA in Chicago, Illinois. Four panels made up of community members, athletes and journalist talked about the issues of gun violence, solutions and the roles that athletes have to help the solve the issues. 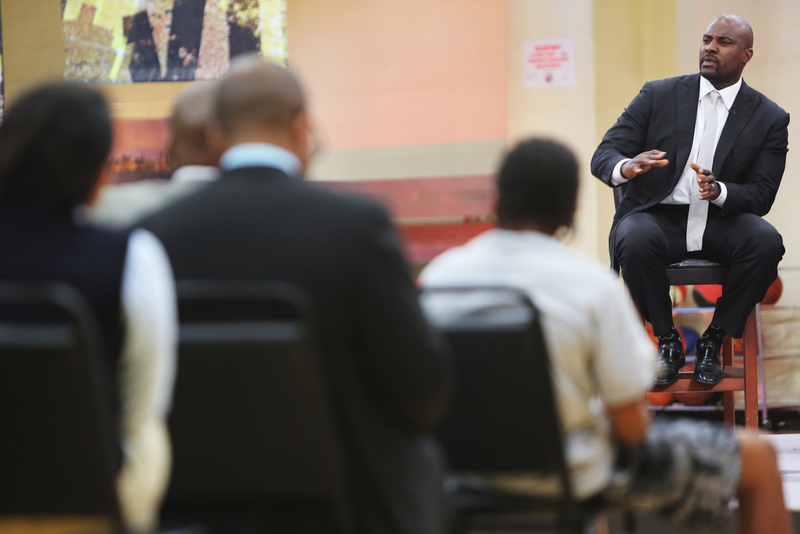 Andre Hamlin answers a question for Simeon High School basketball coach Robert Smith during "An Undefeated Conversation: Athletes, Responsibility, and Violence" on August 25, 2016 at the South Side YMCA in Chicago, Illinois. Four panels made up of community members, athletes and journalist talked about the issues of gun violence, solutions and the roles that athletes have to help the solve the issues. 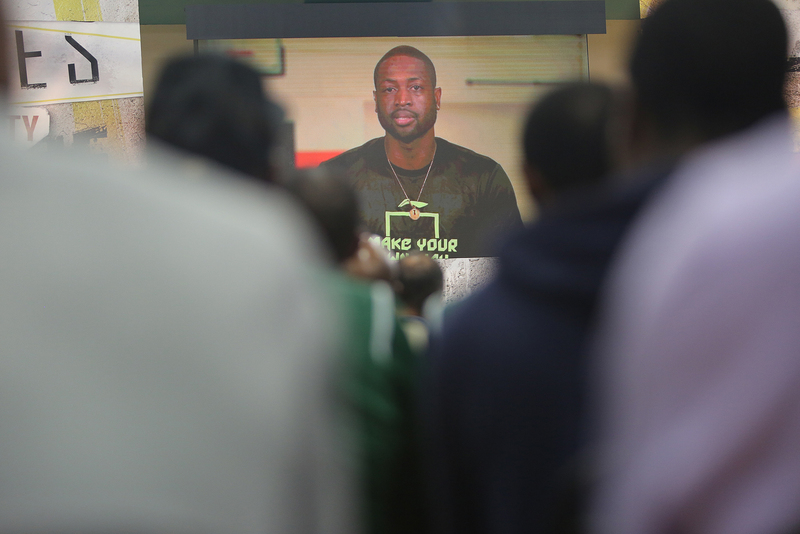 Chicago native and Chicago Bulls guard Dwyane Wade talks about his time growing up in Chicago during "An Undefeated Conversation: Athletes, Responsibility, and Violence" on August 25, 2016 at the South Side YMCA in Chicago, Illinois. Four panels made up of community members, athletes and journalist talked about the issues of gun violence, solutions and the roles that athletes have to help the solve the issues. 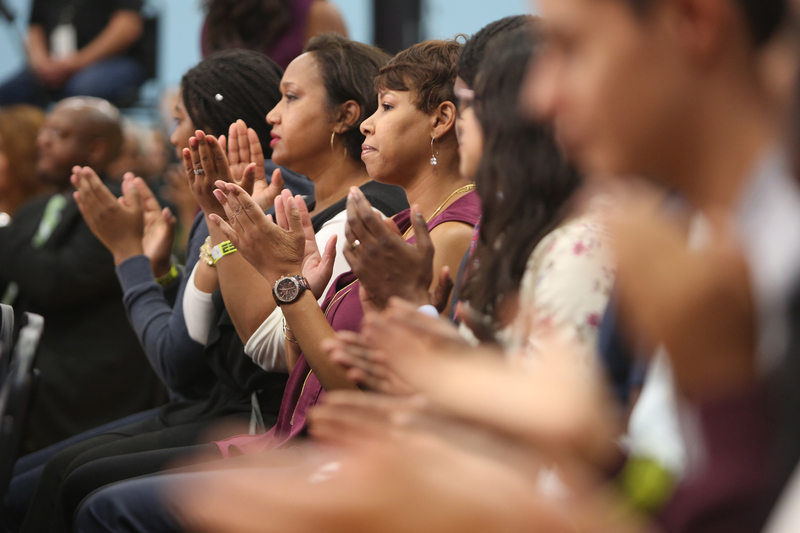 Audience member applaud during "An Undefeated Conversation: Athletes, Responsibility, and Violence" on August 25, 2016 at the South Side YMCA in Chicago, Illinois. Four panels made up of community members, athletes and journalist talked about the issues of gun violence, solutions and the roles that athletes have to help the solve the issues. 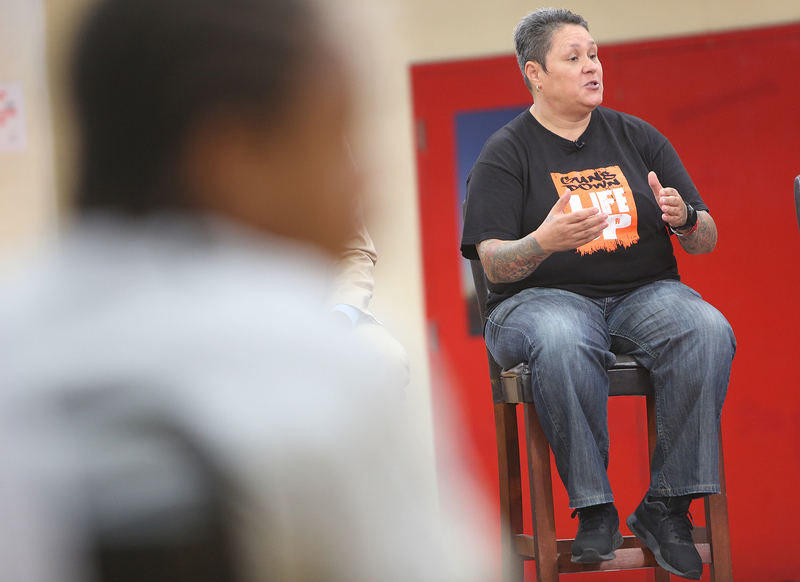 Dawn Valenti talks about her community outreach efforts during "An Undefeated Conversation: Athletes, Responsibility, and Violence" on August 25, 2016 at the South Side YMCA in Chicago, Illinois. Four panels made up of community members, athletes and journalist talked about the issues of gun violence, solutions and the roles that athletes have to help the solve the issues. 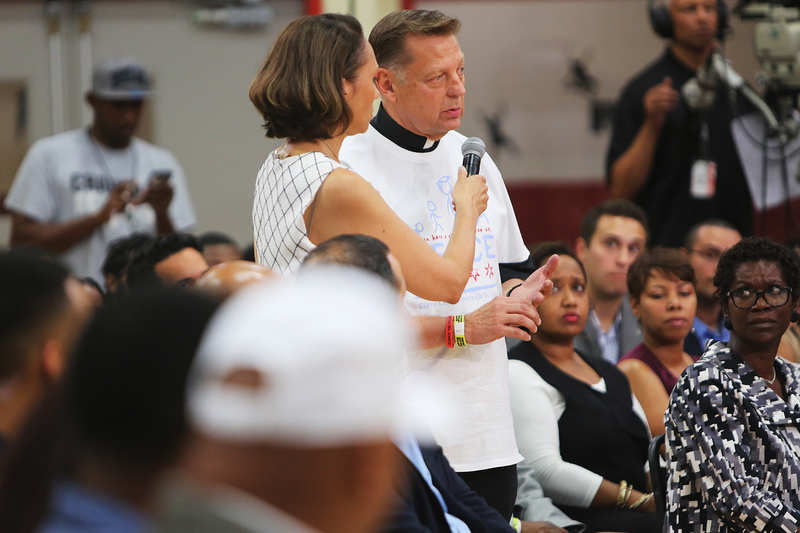 Father Michael Pfleger asks about the responsibility of athletes during "An Undefeated Conversation: Athletes, Responsibility, and Violence" on August 25, 2016 at the South Side YMCA in Chicago, Illinois. 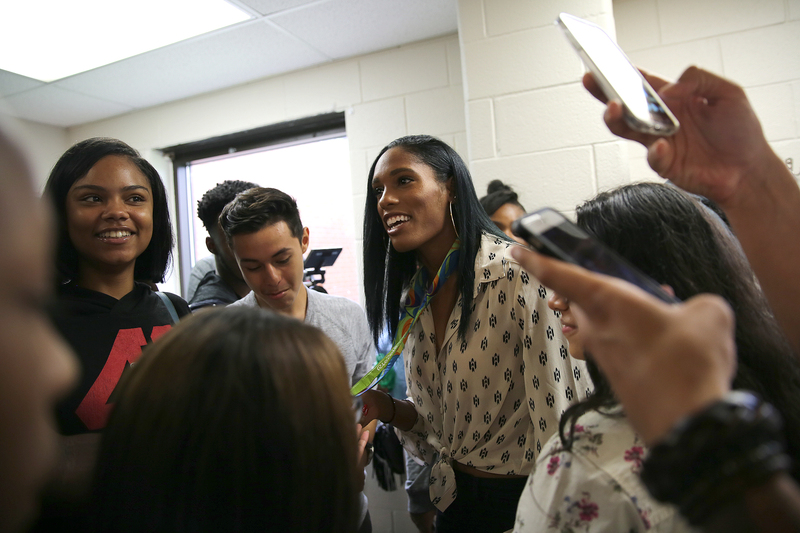 Four panels made up of community members, athletes and journalist talked about the issues of gun violence, solutions and the roles that athletes have to help the solve the issues.